On the 24th (Fri), take a pleasant ride with a tour on horseback, take some stellar pictures from Inspiration Point, and then trek along Navajo/Queens Garden Loop. To find other places to visit, maps, more things to do, and more tourist information, go to the Bryce Canyon National Park trip itinerary maker . San Francisco to Bryce Canyon National Park is an approximately 8.5-hour combination of flight and car. You can also drive; or do a combination of bus and car. The time zone changes from Pacific Standard Time (PST) to Mountain Standard Time (MST), which is usually a 1 hour difference. While traveling from San Francisco, expect slightly colder days and colder nights in Bryce Canyon National Park, ranging from highs of 20°C to lows of 0°C. Finish up your sightseeing early on the 24th (Fri) so you can travel to Page. Start off your visit on the 25th (Sat): take in breathtaking views at Antelope Canyon, explore the striking landscape at Horseshoe Bend, then have fun at Gunfighter Canyon, and finally admire the engineering at Glen Canyon Dam Overlook. To find other places to visit, where to stay, more things to do, and other tourist information, go to the Page trip planner . Do a combination of car and shuttle from Bryce Canyon National Park to Page in 3 hours. Alternatively, you can drive. While traveling from Bryce Canyon National Park, expect somewhat warmer days and much warmer nights in Page, ranging from highs of 30°C to lows of 15°C. Finish your sightseeing early on the 25th (Sat) so you can drive to Monument Valley. Monument Valley is a region of the Colorado Plateau characterized by a cluster of vast sandstone buttes, the largest reaching 1000ft above the valley floor. On the 26th (Sun), don't miss a visit to Monument Valley Navajo Tribal Park, then look for gifts at Monument Valley Navajo Market, and then capture your vacation like a pro with an inspiring photography tour. For ratings, other places to visit, maps, and tourist information, read our Monument Valley day trip planning website . You can drive from Page to Monument Valley in 2.5 hours. Traveling from Page in May, expect Monument Valley to be slightly colder, temps between 27°C and 7°C. Cap off your sightseeing on the 26th (Sun) early enough to go by car to Grand Canyon National Park. Kick off your visit on the 27th (Mon): explore the stunning scenery at Yavapai Point, get great views at Yaki Point, then trek along South Kaibab Trail, and finally take in breathtaking views at Grand Canyon South Rim. To find photos, traveler tips, reviews, and more tourist information, refer to the Grand Canyon National Park online trip maker . Getting from Monument Valley to Grand Canyon National Park by car takes about 3.5 hours. Expect a bit cooler temperatures when traveling from Monument Valley in May; daily highs in Grand Canyon National Park reach 23°C and lows reach 0°C. Wrap up your sightseeing on the 27th (Mon) to allow time to travel to Las Vegas. On the 28th (Tue), explore the stunning scenery at Red Rock Canyon National Conservation Area, try to win big at Bellagio Hotel and Casino, and then ponder the design of Bellagio Fountains. Keep things going the next day: examine the collection at The Mob Museum, admire the natural beauty at Bellagio Conservatory & Botanical Gardens, and then shop like a local with The Strip. Discover how to plan a Las Vegas trip in just a few steps with Inspirock's itinerary builder. Getting from Grand Canyon National Park to Las Vegas by combination of flight and car takes about 4.5 hours. Other options: drive; or take a shuttle. Due to the time zone difference, you'll gain 1 hour traveling from Grand Canyon National Park to Las Vegas. Traveling from Grand Canyon National Park in May, you will find days in Las Vegas are a bit warmer (36°C), and nights are much warmer (20°C). Wrap up your sightseeing on the 29th (Wed) early enough to drive to Death Valley National Park. Kick off your visit on the 30th (Thu): trek along Wildrose Peak Trail and then get great views at Dante's View. For reviews, other places to visit, traveler tips, and other tourist information, read Death Valley National Park travel route planner . You can drive from Las Vegas to Death Valley National Park in 2.5 hours. Another option is to take a bus. Traveling from Las Vegas in May, expect little chillier with lows of 15°C in Death Valley National Park. Finish your sightseeing early on the 30th (Thu) so you can drive to Joshua Tree National Park. Start off your visit on the 31st (Fri): explore the striking landscape at Wonderland of Rocks, then pause for some photo ops at Johnny Lang Grave, and then take your sightseeing to a higher altitude at Eureka Peak. For more things to do, reviews, where to stay, and other tourist information, use the Joshua Tree National Park trip maker site . Traveling by car from Death Valley National Park to Joshua Tree National Park takes 5 hours. Alternatively, you can do a combination of bus and taxi; or do a combination of bus and car. Traveling from Death Valley National Park in May, you can expect nighttime temperatures to be a bit warmer in Joshua Tree National Park, with lows of 19°C. Finish your sightseeing early on the 31st (Fri) so you can drive to Malibu. Malibu is a beach city in Los Angeles County, California, situated 30mi west of Downtown Los Angeles. On the 1st (Sat), see the interesting displays at The Getty Villa, then explore the stunning scenery at Solstice Canyon, and then immerse yourself in nature at Point Dume State Beach and Preserve. For other places to visit, photos, where to stay, and tourist information, read Malibu day trip planning tool . Traveling by car from Joshua Tree National Park to Malibu takes 4 hours. Alternatively, you can do a combination of taxi and bus; or do a combination of car and bus. When traveling from Joshua Tree National Park in May, plan for little chillier days in Malibu, with highs around 25°C, while nights are about the same with lows around 17°C. Wrap up your sightseeing on the 1st (Sat) to allow time to drive to San Diego. On the 2nd (Sun), pause for some photo ops at Cabrillo National Monument and then meet the residents at San Diego Zoo. For other places to visit, traveler tips, more things to do, and more tourist information, read our San Diego day trip website . Getting from Malibu to San Diego by car takes about 3 hours. Other options: do a combination of bus and flight; or take a train. June in San Diego sees daily highs of 26°C and lows of 20°C at night. Finish up your sightseeing early on the 2nd (Sun) so you can travel to Sequoia and Kings Canyon National Park. Start off your visit on the 3rd (Mon): trek along Lakes Trail in Sequoia National Park, then delve into the lush surroundings at Giant Forest, and then cruise along Generals Hwy. You can plan Sequoia and Kings Canyon National Park trip in no time by asking Inspirock to help create your itinerary. You can fly from San Diego to Sequoia and Kings Canyon National Park in 4.5 hours. Alternatively, you can do a combination of train and bus; or do a combination of bus and train. When traveling from San Diego in June, plan for warmer days in Sequoia and Kings Canyon National Park, with highs around 40°C, while nights are about the same with lows around 19°C. Finish your sightseeing early on the 3rd (Mon) so you can take a bus to Mammoth Lakes. Mammoth Lakes is a town in Mono County, California, the county's only incorporated community. Kick off your visit on the 4th (Tue): contemplate the waterfront views at McLeod Lake, then contemplate the waterfront views at Skelton Lake, and then take an in-depth tour of Mammoth Museum at the Hayden Cabin. To see traveler tips, reviews, ratings, and other tourist information, read Mammoth Lakes journey site . Traveling by bus from Sequoia and Kings Canyon National Park to Mammoth Lakes takes 3.5 hours. Traveling from Sequoia and Kings Canyon National Park in June, expect Mammoth Lakes to be little chillier, temps between 30°C and 7°C. Cap off your sightseeing on the 4th (Tue) early enough to catcht the bus to Yosemite National Park. Kick off your visit on the 5th (Wed): explore the striking landscape at El Capitan, snap pictures at Pohono Bridge, then take in the dramatic scenery at Vernal Fall, then don't miss a visit to Yosemite Conservation Heritage Center, and finally explore the striking landscape at Glacier Point. For other places to visit, reviews, traveler tips, and other tourist information, go to the Yosemite National Park trip builder app . Getting from Mammoth Lakes to Yosemite National Park by bus takes about 1.5 hours. 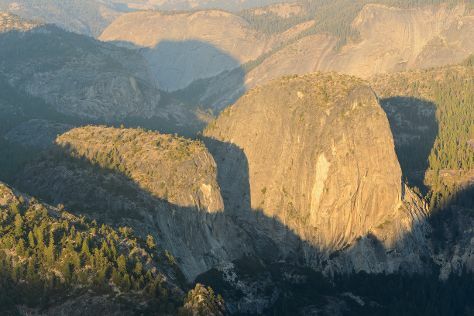 In June, daily temperatures in Yosemite National Park can reach 30°C, while at night they dip to 7°C. Finish your sightseeing early on the 5th (Wed) so you can drive to San Francisco. San Francisco is known for nature, museums, nightlife, shopping, and childrens museums. 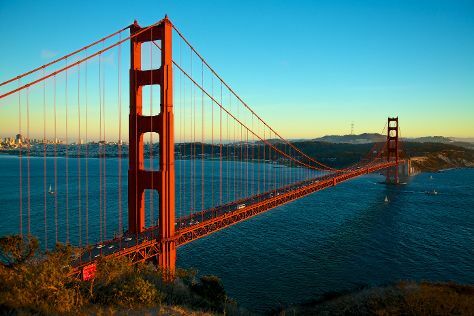 Your plan includes some of its best attractions: snap pictures at Golden Gate Bridge, engage your brain at Exploratorium, head off the coast to Alcatraz Island, and don't miss a visit to Golden Gate Park. For maps, photos, and more tourist information, read our San Francisco trip itinerary builder tool . You can drive from Yosemite National Park to San Francisco in 4 hours. Other options are to do a combination of car and flight; or do a combination of bus and flight. Traveling from Yosemite National Park in June, you will find days in San Francisco are a bit cooler (25°C), and nights are a bit warmer (15°C). Wrap up your sightseeing on the 8th (Sat) to allow time to travel back home.